Entertainment sites ranked second, accounting for 10 percent of minutes (up 1.2 percentage points from the previous year), while Portals accounted for 8.8 percent of total minutes. Although it represented just 2.0 percent of total minutes, time spent on Retail sites grew 0.5 points in the past year as online shopping continued to gain adoption. Among the top properties, visitors were most engaged on Facebook.com, spending an average of nearly 4 hours on the site in June. Visitors spent 2.5 hours on Google Sites, with YouTube accounting for a strong share of time spent on the property. Google sites had an astounding reach – 94.8% of India’s online users visited Google or one of Google sites (like YouTube). Facebook.com has a reach of 83.4% in India, meaning around 4 out of 5 online Indians visit the popular social networking site. 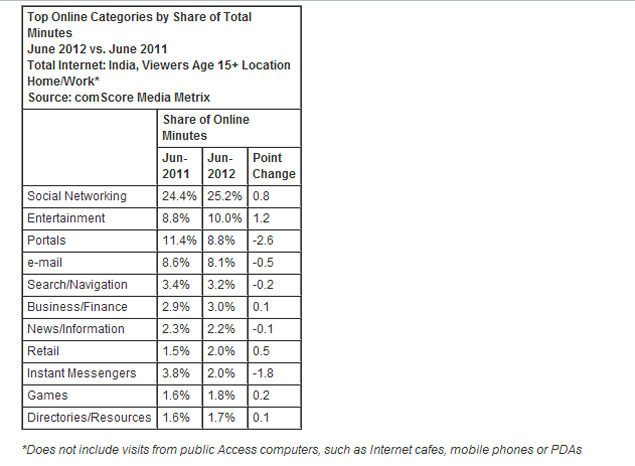 According to the analysis done by comScore, a leading website that measures online traffic, over 61 million Indians, age 15 and above accessed Internet from their homes or work in June 2012. The survey did not include visits from public Access computers, such as Internet cafes. Interestingly, the survey did not include personal devices such as mobile phones either. Since users accessing Internet via mobile devices represent an increasingly large percentage, we would love to see how including them would impact this data. Nonetheless, the data makes for interesting reading.